An experienced skydiver who died in front of his best friend made one fatal "misjudgement" in a routine training exercise, according to his father. Aiden Chaffe, 31, held his dive for too long before hitting the ground while travelling at about 50mph on Monday. 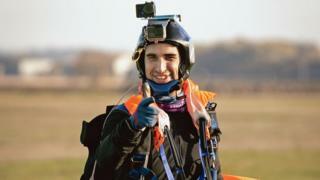 The father-of-two, from Shardlow, Derbyshire, had completed about 1,400 jumps in his life. He leaves behind long-term partner, Pip, as well as his children Harry, eight, and 18-month-old Olivia. Mr Chaffe's father, Bryn, who is also a professional skydiver, said his grandson Harry kept asking his mother "if he wishes hard enough, will he come back?". He added that "devastated" was an "absolute understatement" to describe what the family was going through after his son's death in Langar, Nottinghamshire. He said: "It wasn't reckless, he wasn't doing anything crazy, he just made a misjudgement and that one mistake killed him." Mr Chaffe senior, of Billingham on Teesside, said that after the fall his son's friends "were with him in the landing area attending to him - in fact his very best friend, who is in absolute pieces". "He had to look after his dying friend," he said. He has set up a GoFundMe page, which has already raised more than £19,000, to help his son's children and partner. "The only thing I can do is what I'm doing now and that is to make sure that we help Pip, Harry and Olivia and we make sure they know who Aiden was." Richard Wheatley, chief instructor at Skydive Langar, said: "Skydiving is a small community, and we know each other well. Our thoughts are with Aiden's family at this time." Nottinghamshire Coroner's Court confirmed Mr Chaffe's file had been passed to the coroner, but no inquest date has yet been fixed.